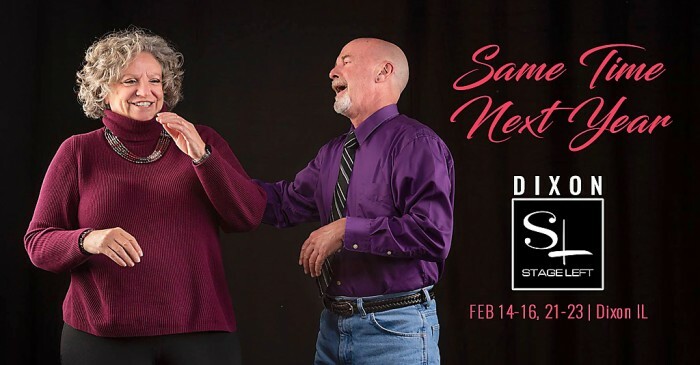 Dixon Stage Left presents one of the most popular romantic comedies of the century, "Same Time, Next Year," for 2 weekends with showtime at 7:30 pm. This Tony award winner ran four years on Broadway, winning the Tony Award for lead actress Ellen Burstyn, who later recreated her role in the successful motion picture. It remains one of the world’s most widely produced plays. The plot follows a love affair between two people, Doris and George, married to others, who rendezvous once a year. Twenty-five years of manners and morals are hilariously and touchingly played out by the lovers. Go to the web link above for ticket information.